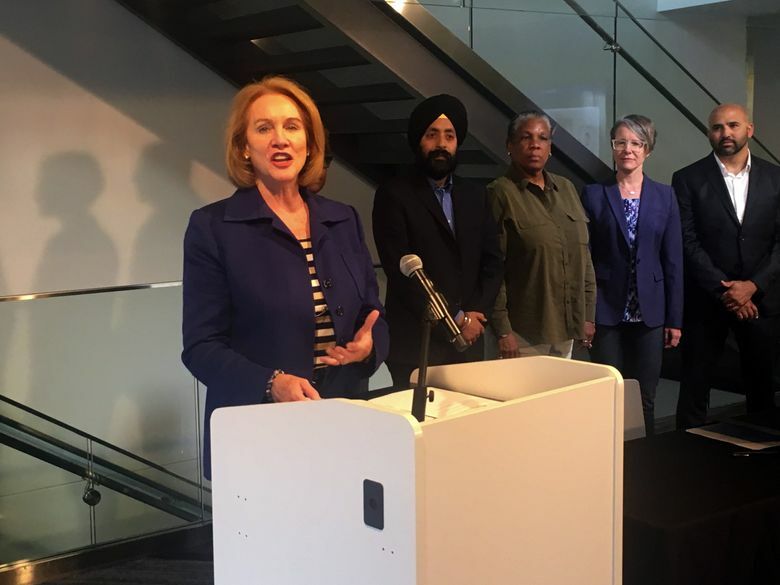 Seattle Mayor Jenny Durkan signed an executive order creating an Innovation Advisory Council and named its co-chairs. Besides Amazon, participants at this point include Microsoft, along with Zillow, Expedia and Tableau, whose leaders spoke out this year against the idea of a head tax. Durkan said the Innovation Advisory Council concept grew from discussions during her campaign last year about working with local companies, rather than in response to this spring’s head-tax battle. She said she reached out to the businesses. Asked about specifics, the mayor said the participants could help design an app allowing the city and service providers to quickly and easily connect people experiencing homelessness with shelter beds and benefits. “Right now, our Navigation Team goes out” to make contact with people living on the street “and they literally are on their phones calling shelters asking, ‘Do you have space?’ ” Durkan said. In contrast, “I can pick up my phone today and can probably reserve a room on any of the seven continents, except for maybe Antarctica, for tomorrow,” she said. The mayor and City Council passed an annual tax of $275 per employee in May on Seattle’s highest-grossing businesses. But they repealed the measure less than a month later under pressure from a referendum campaign bankrolled by businesses and supported by voters lacking trust in City Hall to spend the money effectively. Expedia President Aman Bhutani, a co-chair of Durkan’s new group, downplayed the effect of the tax debate. In an interview, Bhutani said his initial goal is to learn more about the city’s problems. Steve Schwartz, senior public affairs manager for Tableau, said the head-tax debate got corporate leaders talking and thinking about City Hall. Racquel Russell, vice president for government relations at Zillow, said the real-estate listings company can contribute housing and economic research. More than 60,000 software developers call the Puget Sound region home and more than 100 out-of-town companies have opened engineering centers in Seattle, according to Durkan’s office. The tech-company council isn’t the only Durkan group charged with addressing homelessness. The mayor joined with King County Executive Dow Constantine in December to create One Table, a 75-member regional effort. That panel’s work stalled during the head-tax battle and is ongoing, with a meeting scheduled for Friday.